FLUXX is an amazingly fun card game that can be played by anyone. It is an easy game to learn as the rules start out very simple, but the game’s rules are constantly changing during game play. I guess you could say that the rules of the game are in a state of constant flux! Fluxx has even won awards from MENSA (The High IQ Society) for being such a great game. FLUXX has been my most favorite card game ever since I first played it, back when it was in one of the early editions. Currently Fluxx is up to version 4.0 and the game’s major popularity has led it to spawn multiple variants including Monty Python Fluxx, Eco-Fluxx, Pirate Fluxx, Zombie Fluxx and more. The recently released Oz Fluxx, Cthulhu Fluxx, & Regular Show Fluxx have all been great sellers and Looney Labs studios is always looking for new themes to release as new versions of Fluxx. It all begins with one basic rule: Draw one card, Play one card. You start with a hand of three cards… add the card you draw to your hand, and then choose one card to play, following the directions written on your chosen card. As cards are drawn and played from the deck, the rules of the game change from how many cards are drawn, played or even how many cards you can hold at the end of your turn. This game is super fun because of how the rules are constantly changed by the players playing this tabletop card game. There are Rules cards, Action cards, Goals, Keepers, & Creeper cards in the Fluxx game. The fun of this game comes from the ever changing rules and changing win conditions. The action cards are also great fun because you can switch the turn order, trade hands, steal cards and Keepers, take an extra turn, and so much more. Review the complete Fluxx rules sheet at the Looney Labs web site. A few years back I was attending the annual Origins Gaming Convention in Columbus, Ohio. I was there playing in the MageKnight National Championships, which I ended up placing in 5th place. 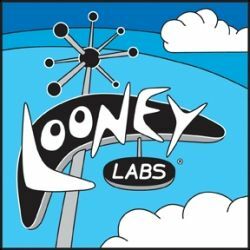 It was an amazing weekend of gaming, but the room I spent most of my free time it happened to be the Looney Labs room which was manned by staff from the Looney Labs company. Here we were allowed to play Fluxx and other table top card games that were created by Looney Labs. It was a super fun room to hang in and was great playing all of the Fluxx variants and the other games from the creators. While I was wandering the massive Origins vendor floor, I happened upon the booth manned by Andrew Looney and his wife. They were both dressed in mad scientist coats and were greeting the gamers wandering by their vendor booth. I must say that both Mr. Looney and his wife were very friendly and down to earth people. For taking the time to stop by and chat with the Looney Labs crew, Andrew Looney himself pulled out a special edition Promo Fluxx card from deep within his lab coat. He pulled out this super rare promo card and asked for my name. 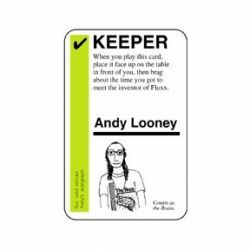 The Promo card was the “Andy Looney” card, which is playable in the Fluxx game. He autographed the card for me and he had drawn a speech bubble that said, “Hi Scott!” That personalized the Promo card for me, but the cool thing was that anytime the card is played during a game, per the card’s text, I had to explain about the time I met the creator and how I got this card. That definately made my deck feel a bit more special than anyone else’s Fluxx deck, because I met the creator and had the promo card to prove it! Since then, they have released many more promo cards for Fluxx, except now you can purchase them for a small price. You don’t have to attend a major gaming convention to get your very own promo cards. Promo Cards are additional cards that are available to be added to your card deck to give it a little more variety and style. Many Promo cards were originally only available from gaming conventions or from purchasing special limited edition gift packs. You could also get them from the game’s creator himself, as I did. These promo cards add variants for existing cards or are completely new cards or card rules that can be added to keep the game fresh. Luckily, many of these Promo cards are available for purchase for small amounts. 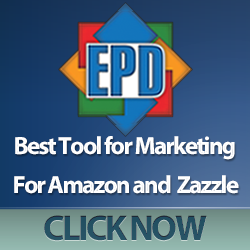 You no longer have to hunt them down at gaming conventions. In addition to Promo cards, you can also customize your deck with Expansion sets like the Christian or Jewish Expansions. You can further customize your deck buy using the Fluxx Blanxx Cards to design your own goal, action, creeper, keeper, new rule, or action card. Fluxx is the amazing card game with the ever changing rules. Looney Labs has released more than just your basic Fluxx 4.0 set and it’s expansions. 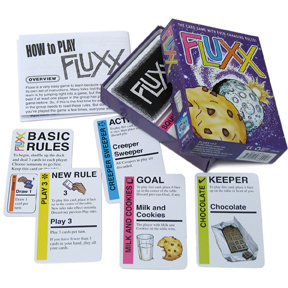 The original version was so popular that Looney Labs created multiple varieties of the Fluxx card game. There are so many versions of Fluxx available that everyone should be able to find a variant that they find amusing, fun, and enjoyable. All of these different versions of the top selling Looney Labs card game are based on the same basic Fluxx rules. A few of the various specialty versions may introduce a new rule or a new rules variant, but most sets can be mixed and played together. The themed sets tailor all of the cards to fit within the theme. So in Oz Fluxx, you will see cards like Dorothy, The Wicked Witch, Toto, and Flying Monkeys. Some of the action cards will even having you performing tasks based on the theme, such as talking like a pirate in Pirate Fluxx or singing silly songs in Monty Python Fluxx. You can even add to the fun by tailoring your specialty decks with specific theme promo cards designed for each set like Sir Not Appearing In This Game from Monty Python Fluxx. Let us know in the comments please.